It's easy to put down a glass. You just put it on the table. It won't spill unless somebody tips it over. How did people put a full drinking horn on the table? Did they have some sort of thingy to keep it in an upright position? Or were you supposed to empty it always before putting it down? In short, either when it was empty or it had a stand. 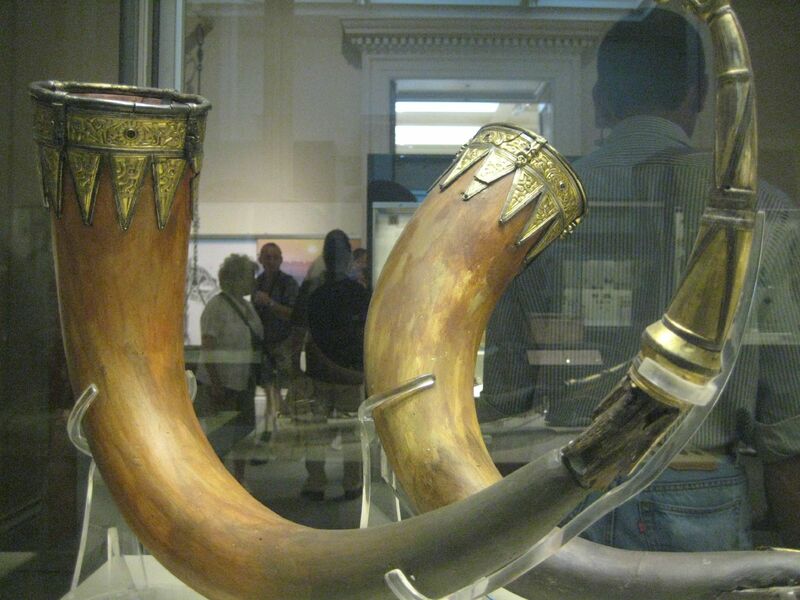 Drinking horns were used by many different cultures on different continents (Africa, Asia, the Americas, Europe e.t.c.) and in different time periods up to this day. Often, they were not intended to be put down while liquid remained but this was not always the case. Xenophon, among others, attested to drinking from horns in Thrace and emptying the horn was clearly an expected ritual, be it in the course of a discourse or when drinking to someone's health. The Thracians also engaged in drinking matches. 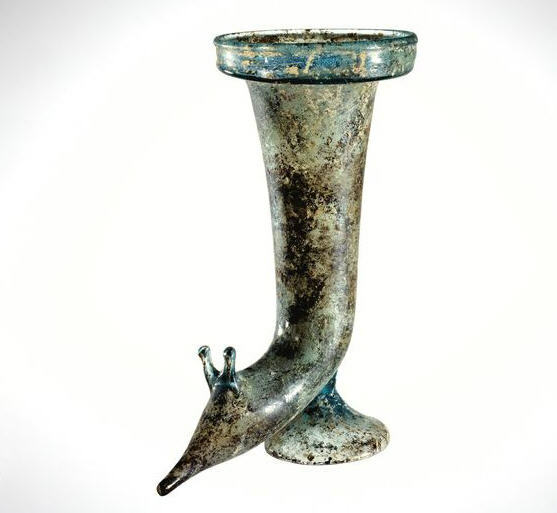 In Roman Artefacts and Society, Ellen Swift says early Roman drinking horns were mostly small and "drinking from the tip was the norm in the early Roman period" and some "have an applied foot that affords standing on a flat surface". Later examples are larger, mostly drunk from the mouth and seem to be designed to be passed around and not set down until empty. A late Roman-Republican banquet scene in a fresco from Herculaneum, Italy. 59 x 53 cm. 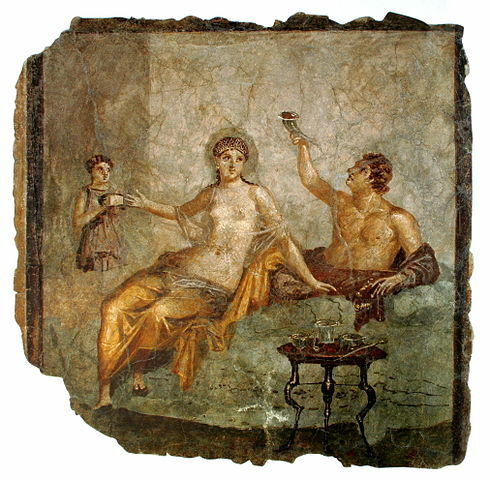 The woman wears a transparent silk gown while the man to the left raises a rhyton drinking vessel. According to a saying of the period: “In war is proved what was pledged over ale.” Women also had a clearly defined role in hall etiquette. They acted as cupbearers and were referred to by the bards as “peace weavers,” in the sense that by passing a drink from warrior to warrior, they maintained the friendship between them. The cup, or horn, was handed to the drinker in strict order of precedence—first to the hall lord, often with the injunction to be joyful at drinking, then to the duguo—the elder retainers—next the geoguo—young retainers—and finally to guests. When the purpose was friendship, feasting, peace or toasting with alcohol, it seems entirely appropriate not to put down a drinking vessel until it has been drained. In fact, the tradition of emptying the horn continues to this day in, for example, Georgia where the "the glass (or horn!) has to be drunk ad fundum". However, horns were not just used for alcohol but also for milk and water and for decorative purposes, drinking or otherwise. It was common (and still is in poor communities) to use every last scrap of an animal (e.g. the Vikings) so it wouldn't make sense not to make use of something that could be fashioned into an impressive-looking drinking vessel. As horn is an organic material and susceptible to decay, metal mounts are nearly all that remain from Early Medieval drinking horns. For example, we have two 9th century drinking horn fittings found in Scotland on display in Creative Spirit; a silver rim mount from Burghead, Moray and a tinned copper-alloy terminal mount from Pierowall, Westray in Orkney. Both of these mounts are the size which would fit locally available cattle breeds. However, metal fittings from exceptionally large horns have been found in high status Anglo-Saxon burials, including those at Sutton Hoo and Taplow in south-east England. 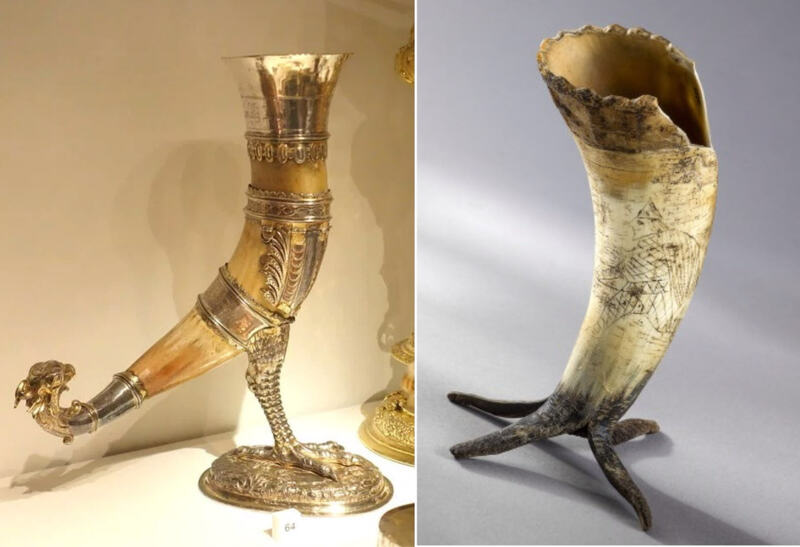 Here are two examples of drinking horns with stands. The one on the left is Viking: "A drinking horn exhibited in the Nordiska Museum in Stockholm, Sweden." The one on the right "Medieval period drinking horn, made from ox horn. (Photo: Åge Hojem, NTNU University Museum)"
The one below is in the British Museum and is late medieval (15th century). Finally, a couple of aurochs drinking horns without a stand (although they may have had), from the Taplow burial (7th century Anglo-Saxon). Ideal for passing around at feasts? 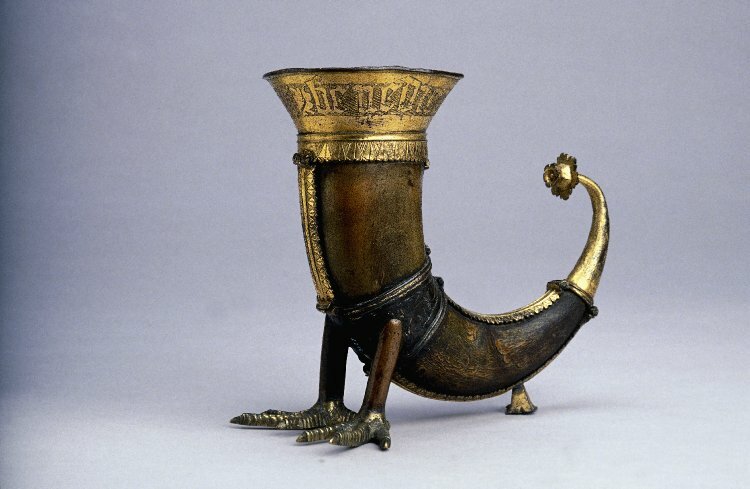 A drinking horn was not a regular cup. Vikings had plenty of those, they weren't living in the stone age. A drinking horn is a contest, a drinking game: who can empty the whole horn in one go, without spilling the content. We did the same in the army, with a glass boot. Source: me, under the table. I wasn't very good at it. The whole purpose of the drinking horn is that you drink it to the bottom, so that nothing remains, and then you can lay it in the table. Not the answer you're looking for? Browse other questions tagged food vikings early-medieval or ask your own question. How did people react to Cavendish bananas when they first replaced the Gros Michel strain? Did barbarians capture monks or priest of civilized kingdoms to teach them? How did Irish defeat Norse at Battle of Tara in 980 CE. ?